Our garden season is coming to a close, yet we are already planning for next growing season! Our sunflowers have been cut and are drying. Once the sunflower head is dry, we can use the seeds to plant new sunflowers in the spring. We are also planning to share the seeds with the preschool teachers for Mother’s Day gifts- to be potted, grown, and presented at Mass and Muffins with Mom this coming May. We are hoping to have enough sunflower, as well as cilantro seeds, leftover to sell at the Charge of the Knights 5K Race. Becky Lukan used two of our remaining squash to make a delicious coconut squash soup for the teacher treat luncheon in early October. 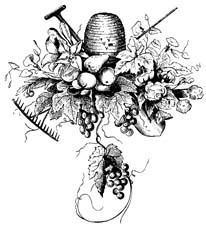 There are also tentative plans to share our garden bounty periodically at the Williamsville Farmer’s Market throughout the 2019 season. 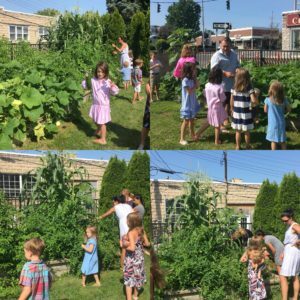 As we head into winter, may we be thankful for a bountiful garden season, as well as for the blessing of the beautiful garden, available for the entire SSPP Faith Community to enjoy. and Mrs. Nigro’s 2nd grade classes all helped to plant this year garden from seeds. The cornstalks pictured below were planted as seeds! manure, hose connectors, and paint sticks to use as markers. Thank you Ed Young’s Hardware for supporting our garden! Chris Nalbach, Lisa Miranda, and Becky Lukan. Our garden is now in full bloom and we invite you to take a look! We also invite those of you with a green thumb and/or a passion for gardening to consider helping in our garden! SSPP started a school garden in Spring 2012, with the aim in mind that all our children will participate in growing healthy produce – and even learn how to create delicious meals with the food they have grown! This will offer our children a hands-on, educational experience in the natural environment, while being taught about nutrition, health, cooking and agriculture. 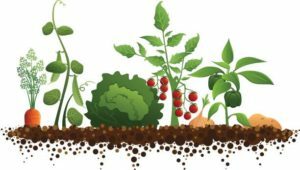 Besides learning how to grow food, the will also come to appreciate the flavors of vegetables and gain knowledge to make good choices for their own nutrition. We are always seeking volunteers to join the SSPP Edible Schoolyard Committee, to help us in the ongoing planning and execution of the vision of an Edible Schoolyard program at SSPP. We are looking for any adult affiliated with the school or church, who have even a tiny bit of understanding of gardening, a passion for food, a talent for cooking, and also those who have time, talent or treasure to offer. If you are interested in helping out with the SSPP Edible Schoolyard, and would like to be a part of this committee, please contact Willard & Kitty Brooks at brooks4ofus@gmail.com or 632-2991.